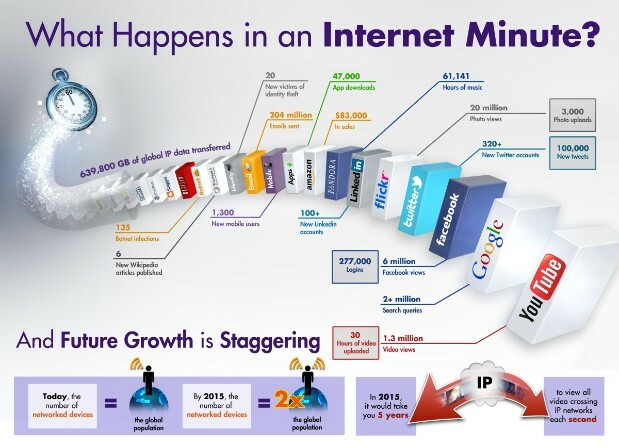 What happen in an Internet Minute? On the internet, time is overrated. To put it in a few words, an Internet Minute is measured in video and photo uploads, app downloads and Facebook views. By 2015, it is estimated that you will need almost 5 years to view all the videos crossing IP networks each second. Albert Einstein said that time is an illusion. Time is something we want the most, but what we use worst. That's why smart content will win the battle of internet minutes. You will click on it, you will read it and you will come back to it, even if another internet minute full of content will come.